Infographic: Is This Old AC Really Destroying the World?! A new tool from Pentagram’s Lisa Strausfeld reveals the brutal truth about your home energy consumption. Homes are responsible for more than 20% of energyconsumption in the United States. But how do you pinpoint the sourcesof all that CO2? An impressive new data-visualization tool from GE andPentagram’s Lisa Strausfeld, who knows from information design, helps determine precisely which household electronics dothe most damage. The tool starts with a grid of all the energy-suckers you’d find in your house, arranged in order of how power hungry they are. Then, you can rearrange that grid a few different ways–the most important being cost over time. Click that view, and you can pick a time frame(day, month, year) and the state where you live. 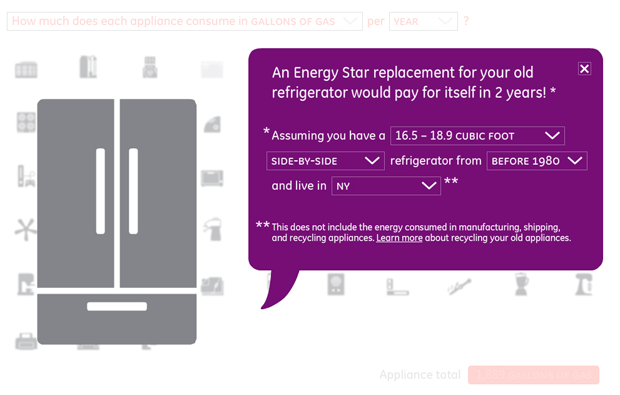 Finally, clicking on each appliance reveals stats about how expensive it is to run. So blasting the AC in Californiachecks in at $700 a year, and running the fridge in South Carolina sets youback $158. The project is the latest in a grand series of infographics GE has been producing, in an effort to teach people about how to consume resources more wisely. For example, Ben Fry created a health-care calculator here, which shows the cost of getting sick. David McCandless created another showing how fitness helps work performance. And Thomas Porostocky, working with GOOD magazine, showed the affordability of health care.